Beckett Bear, the university's sporting mascot, has signed up to run the Leeds Half Marathon in May to raise money for the Bright Futures Scholarships at Leeds Beckett. You may remember Beckett Bear's love of sport from the yearly Varsity matches against the University of Leeds or the BUCS clashes on Wednesday afternoons at Headingley Campus. This year he's swapping his rugby boots for running shoes and is taking on a marathon challenge of his own - or more accurately a half-marathon challenge - running the 13.1 mile Leeds Half Marathon on Sunday 12 May to raise £1,500 to support Leeds Beckett University's Bright Futures Scholarships. 80 Bright Futures Scholarships have been awarded to talented first-year students at Leeds Beckett who are struggling with the cost of a university education. The scholarships are funded by alumni and friends of the university. Beckett Bear has already started his gruelling training regime – keep your eyes peeled when you’re out and about on campus for a furry purple flash darting around the Acre. Sponsor Beckett Bear via JustGiving. Share his fundraising page on your social media channels. Cheer him on at the Leeds Half Marathon in May. Follow his updates on social media. 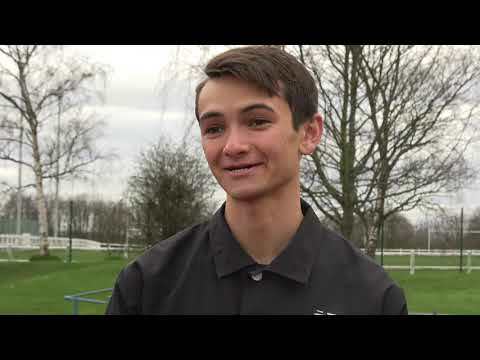 Beckett Bear is the biggest supporter of our university sports teams, so while Beckett Bear got some laps in on the athletics track, we caught up with one of our sporting stars - current student and GB Triathlete Alex Yee - to see how he rates Beckett Bear's chances of success. 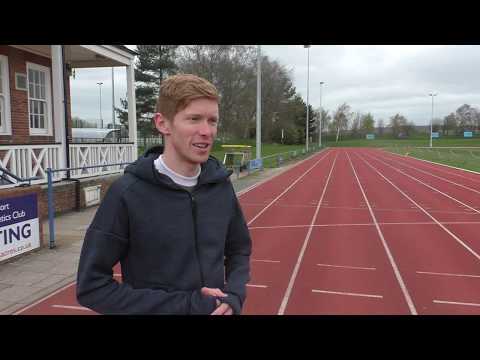 Beckett Bear is worried that he may have to walk some of the Leeds Half Marathon to finish the event - so who better to get some training advice and tips from then alumnus and Olympic Race Walker Tom Bosworth?